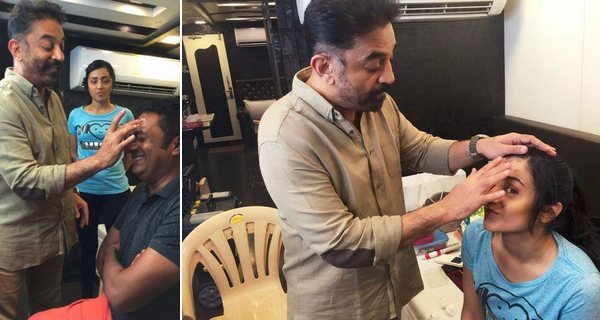 Actor-filmmaker Kamal Haasan is busy juggling between acting and doing make-up for his co-actors Trisha Krishnan and Prakash Raj on the sets of his upcoming Tamil thriller "Thoongaavanam". "The characters of Trisha and Prakash Raj require prosthetic make-up. Kamal sir is helping them with the make-up on the sets. Although there's a makeup artist, final touches to the actors are given by Kamal himself," a source from the film's unit told. While working on his Tamil film "Indian", Kamal learnt about the art from American make-up artist Michael Westmore. Being directed by Kamal's long-time associate, Rajesh M. Selva, "Thoongaavanam" is a thriller that unfolds in a single night. The film is currently on floors in Hyderabad. It also features Manisha Koirala, Kishore and Sampath Raj in important roles.